The chart shown above was shared by John Mauldin in his June 4 weekly newsletter, Thoughts from the Frontline. The chart illustrates year-over-year, trailing 12-month earnings per share growth for companies in the S&P 500 (excluding the highest growth sector for the red line and excluding the lowest growth sector for the blue line). Prior to the last two recessions (recessionary periods shaded in grey) earnings followed a distinct pattern – initial earnings recovery after the previous recession, mid-cycle slowdown, brief period of increased earnings growth and an end-of-cycle turn in earnings before the pre-recession rundown in earnings growth. The overall point being made is that we may have already moved through the end-of-cycle turn in earnings and may be in the pre-recession rundown for earnings growth. We consume and analyze a vast amount of information on a day-to-day basis. 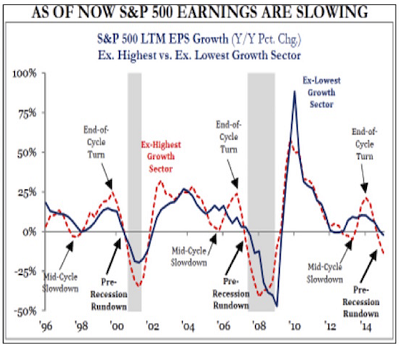 We chose this chart because we believe it illustrates the present corporate earnings environment relative to recessionary periods quite well. By itself, it does not create action for us, but we do incorporate the chart into the mosaic that drives our decision making. Our view is that aggregate corporate earnings growth for the S&P 500 has actually had indications of softness for a while. Over long periods, top line revenue growth is a necessary element for earnings growth. However, corporate revenue growth has been weak for some time. Near record profit margin levels and other non-organic “boosts” to earnings, such as corporate share buyback programs, have just been able to mask this fact. If weak top line revenue growth is paired with the possibility of a weaker-than-expected economic environment (i.e. GDP growth), second quarter earnings season may end up being weaker in aggregate than most market prognosticators are currently anticipating. How do we incorporate this information into decision making? First, we are taking a relatively defensive approach in our portfolio construction. Second, we are being selective about the entry points for our clients’ investments. Finally, we will be making incremental modifications (trims and adds) to client portfolios over short- to intermediate-term timeframes.